We undertook this audit because body-worn cameras enhance the transparency and accountability of interactions between citizens and the police. The chief of police requested we conduct a performance audit to assess compliance with the department's body-worn camera policy and recommend metrics for monitoring program compliance. Officers assigned body-worn cameras captured video for 33% of officer-dispatched calls from November 2017 to May 2018. Officers also delayed activation and prematurely deactivated the body-worn cameras for many incidents. 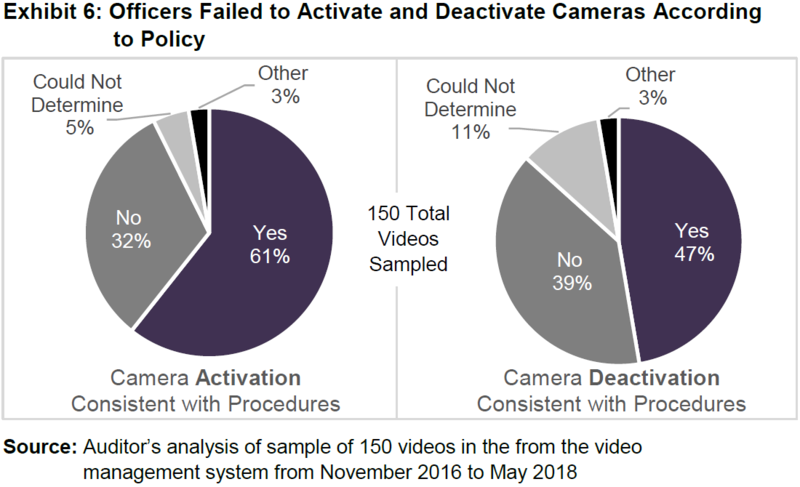 Officers uploaded 74% of videos according to the department's procedures within one day of the date they were recorded. Officers also categorized almost all videos but could improve accuracy of categories assigned. Compliance staff are not reviewing videos as required to monitor compliance with camera policies and ensure video footage is not prematurely deleted. Our recommendations to police focus on ensuring compliance with policies and best practices, as well as monitoring performance metrics associated with body-worn camera usage.